A while ago, my neighbor was burning trash. This is the same neighbor who was going to burn the bed that started the whole revamp of Ryder's room. I owe a huge chunk of my success to Jim and Marilyn and their trash burning tendencies. If it weren't for their pyro-lovin' ways, this blog wouldn't have had half the exposure it's gotten over the years! Anyway, getting back to the burn pile...Jim now knows to check with me before he sets anything on fire. And one day he asked if I had any desire for this little guy. 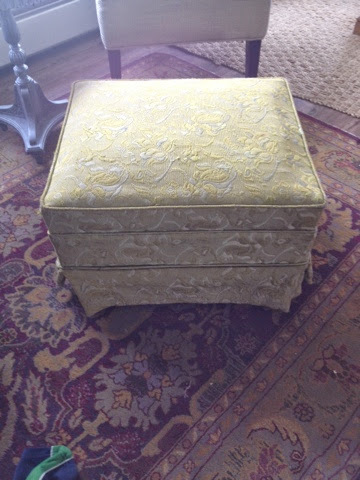 It's a cute little ottoman upholstered in a seen-better-days fabric. But I still took it. I mean really...even though it's ugly, doesn't mean it should be torched. So it sat. We used it actually, even though it wasn't real purdy. It was/is very functional. Actually I'm sitting here in my room with my feet uncomfortably on the ground. I like ottomans. 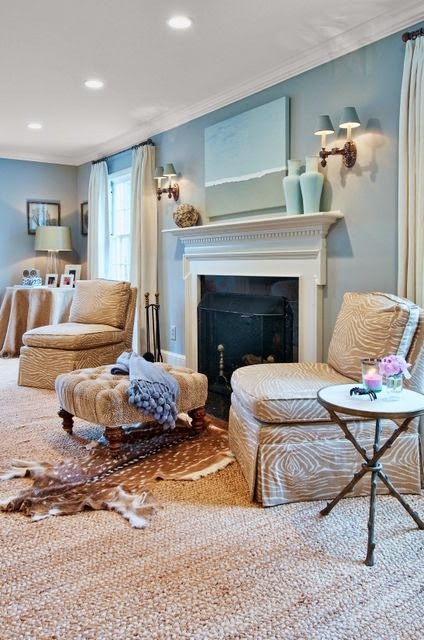 I need ottomans. This is the area of which I speak. So the other day when I dropped off my two chairs at the upholstery farm, I took that ugly ottoman as well. It was time to do her up right. 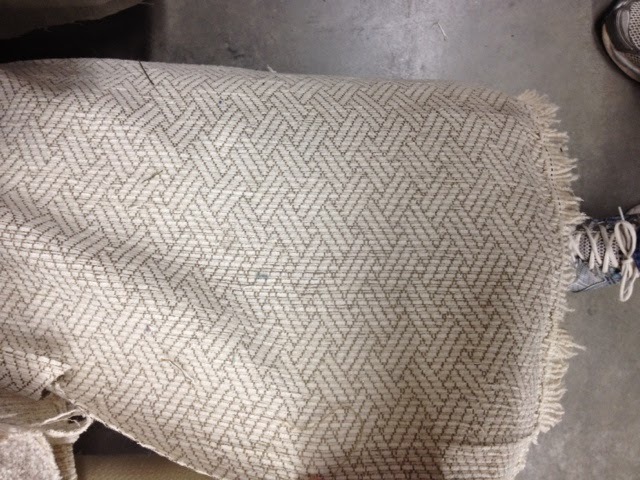 Then just today I picked out this fabric at a local fabric outlet that my upholsterer is going to make a slip out of. 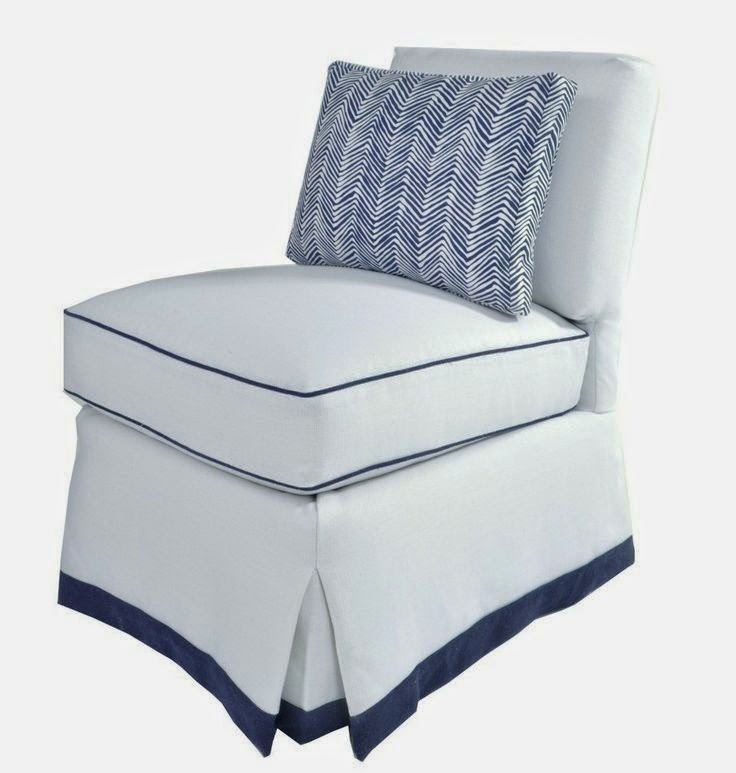 (Don't tell Mitch, but I'm thinking of having the two chairs in our bedroom slipcovered in this as well.) It's a nice heavy upholstery fabric. Neutral but interesting pattern. And just for fun, here are some inspiration pictures of slipper chairs, if I were to ever pull the trigger on getting mine recovered. I like mine, but they're cheap, thus the need/want/desire to get them recovered. We got ours years ago with a gift card from Target. They're the Dolce chair. I would love to have a slip made that had a skirt on it. I've never been a fan of the exposed legs of our chairs. Something simple and sweet like this box pleat. I like the band of trim around the bottom of this one. It just adds a bit of interest (as does the contrasting piping). 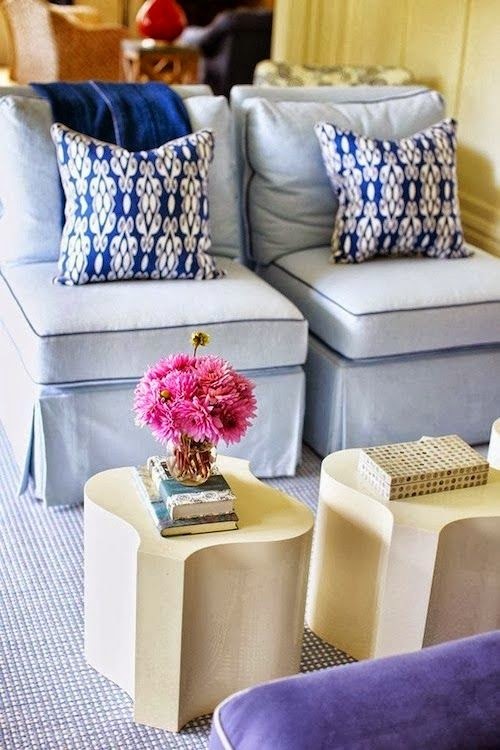 Slipper chairs are so versatile...you can put them anywhere. I'm a fan of the bold but neutral pattern of these guys. So, that's it. Some dreams and some reality. I'm excited to see how the sweet little ottoman turns out. 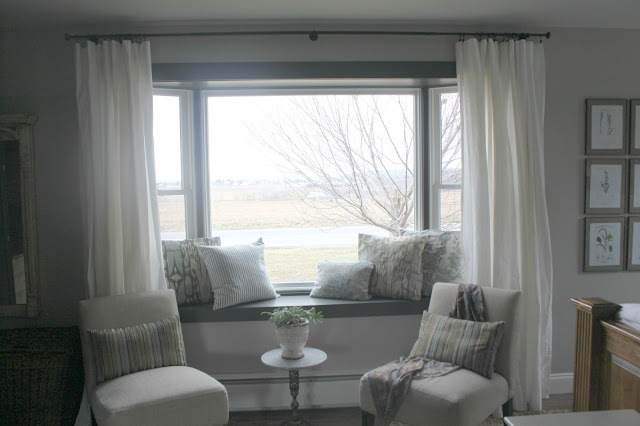 Locals, if you're interested in having some work done by my upholsterer, shoot me an email at kathertzler@yahoo(dot)com. I can give you the deets! Stay tuned for the reveal soon! HI, I just found my way here from sewpereetiquilts. I love your writing and decorating styles. Your master bedroom inspries me as I have a similar large windeom (without the seat. Been looking for just the right chairs .Wish I had a burning type neibghjbor. BTW ,I'm not far. over the MD line. We love L:ancaster Co. There's a level of closeness and an connection you need to make with that individual to motivate them to unwind and open up enough for you to catch their uniqueness and recount their story. Besides I cherish the outfit and area changes that join a senior shoot. I'm working here best essay writing service This time the entire family was included and we had a great time in spite of the cold climate.